I've been playing with a few more hex floor pieces. 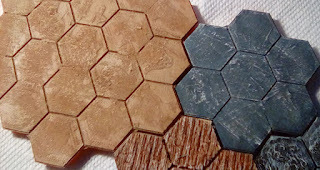 One thing I've been seeing in a lot of printable floors is a sort of natural stone texture. It's a little irregular and uneven, though not so much so to make it unusable as terrain. 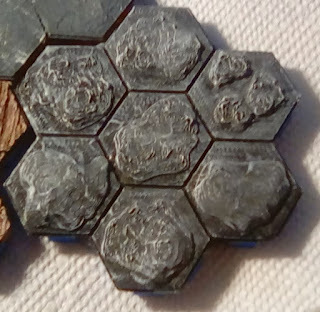 It crossed my mind that rather than build a "natural stone floor" set of pieces, I could print flat floor pieces, shear some "rock" designs in half, scale appropriately, and print with a very, very small Z height. Those get glued to the flat floor and painted. That way, I'm not dealing with huge files (those rock forms use a lot of triangles). Seems to work pretty well. What I'm not quite so happy with is a wooden plank texture. 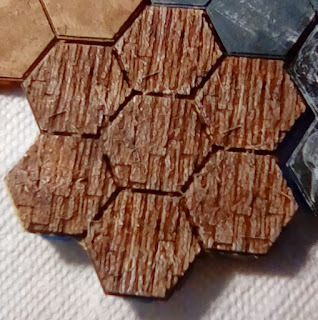 I swiped some very detailed wood plank hexes from a design on Thingiverse and scaled it down to my 1-inch hexes. Unfortunately, it doesn't look like it works well at that scale. That said, I recently switched down from a .4 to a .3mm nozzle, so I'll try it again and see if that helps. Finally, something that I think works really well. I caught a YouTube video, which I naturally can't find now, where a guy who does miniatures points out that using actual sand on your mini bases is bad for representing real sand and dirt because the scale is wrong. Real sand is too big to be mini sand. His solution was baking soda. Baking soda apparently catalyzes cyanoacrylate. That is, if you want your Superglue to set fast, sprinkle a little baking soda on it. The very fine grains also give it a bit of a rough texture. So, then, you can paint your surface with cyanoacrylate, dust on a bit of baking soda, let set a few minutes, and paint. I think it produces a marvelous surface texture.